On June 28, comedian David Letterman gave viewers a “huh?” moment when he opened his Late Show monologue by announcing that he’d just received a degree from — where else? — Biola University. The show begins with an opening monologue. Letterman: This is an important time for a guy running for president. Mitt Romney now has to select a running mate, the vice president. And as we know, that can make or break a ticket. I mean, it’s very important geographically and politically and ideologically — it’s very important to get the right running mate. (Audience laughter.) What’d I say? Paul Shaffer: You said everything right. After a commercial, a seated Letterman begins reading from a sheet of paper. Shaffer: Oh, we are. We are. Letterman: Major league baseball player Todd Worrell. Letterman: He was an all star? Letterman: Who’d you like better: Tim or Todd? The faux “Weekend Late Show” co-hosts give a preview their next show. Bruce: … All that, plus squatter’s rights, making your own shaving cream, and what ever happened to badminton? Saturday on the Weekend Late Show. Linda: Back to you, Dave. Letterman: What ever happened to Biola? What ever happened to Biola? Letterman finishes reading the night’s Top 10 list. Letterman: I wish I had more facts to read about obscure colleges of the United States. That was fun! Shaffer: I enjoyed it very much. Letterman: Have you ever heard of Biola? Shaffer: No … well, I have! Letterman: No you haven’t. 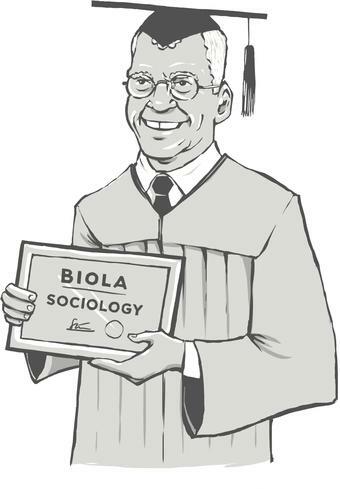 Where did you hear of Biola? Shaffer: I’ve heard of Lou Viola, the agent. Letterman: See, that’s my point. It sounds like he’s mispronouncing it. But it’s Bi-ol-a. (The camera cuts to Christerson.) All right, we’ll be right back. ** Actually, Biola was founded in Los Angeles and moved to La Mirada in 1959. But we do love Whittier. *** Christerson is a longtime professor, but not an alumnus.